While you can easily find sportier and more sophisticated compact crossover SUVs, the 2014 Honda CR-V remains a best seller due to its strong design, ingenious use of space, and good fuel economy. The CR-V's reputation for reliability and strong resale doesn't hurt, either. 2014 Honda CR-V for driving around town. 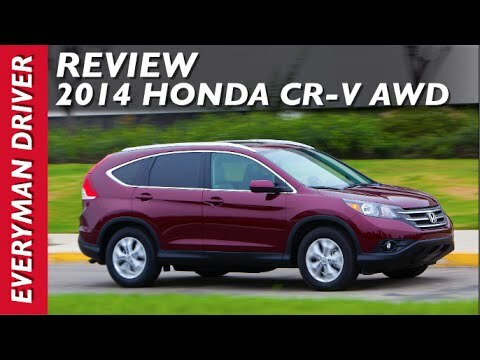 This review is for a 2014 Honda CR-V used for in-town daily driving. The car is comfortable, fuel efficient, and easy to drive. It has leather seats with front seat heaters, a roof rack, and a trim package. Routine maintenance is performed on a regular basis. There have been no major mechanical issues over a four year period, although the battery had to be replaced once. It does not have a navigation package. However, it does have Bluetooth connectivity, a built-in USB connection, and a separate Audio input jack. The Bluetooth connectivity feature enables the ability to use a cellular phone for navigation, phone calls, and receiving text messages. The USB connection is used primarily for charging devices such as cellular phones and tablets. It also keeps devices charged while in use, which provides the ability to use a phone's navigation system. It has a separate auxiliary Audio input port for playing Audio files from external devices using a male-to-male 3. 5 mm Audio cable. This is a nice feature for playing music playlists or Audio books from an external device. The car is used for short city driving trips most of the time. It has been used for one to three hundred mile trips on occasion with good performance and gas mileage. The econo mode helps with better gas mileage with a small decrease in power performance. Overall I have been very happy with this car. There have been only two unsatisfactory issues: 1. A defective battery and. 2. Difficulty getting a Bluetooth device to play through the car speakers. Does the motor run well or not? The car itself is very comfortable, I chose leather seats and they provide easy clean up and a great ride. I like that the car is a smooth ride. All the bells and whistles are easy to use and its got a bit wider wheelbase than the previous model. My biggest issue with the vehicle is that there always seems to be something that sounds or does strange thing inside the function of the motor, etc. The vehicle shakes, very badly and rattles in the motor when idle. I have had the brakes not function correctly on random occasions which makes me feel not safe, but upon having it checked out, they cannot find anything wrong with the vehicle or the brakes. Sometimes it feels as though it is trying to downshift at times that it shouldn't, like on a freeway. Again, they cannot find anything wrong. So, it seems to be a good car that will run forever, if you can get past the random issues that Honda does not seem to see as issues. don't expect to much power cause it only has four cylinder engine. The Honda CR-V is a very affordable and reliable vehicle. The four cylinder engine does not offer to much power especially on inclines. The base model does not come with passenger seat hand rest. It is a very light SUV and sometimes does not handle well on curves and windy driving conditions. On impact it is likely to flip over. The back seats don't have a/c controls and the leg space is limited for tall passengers. The front seats don't come with back storage pockets. The only USB port is inside the middle compartment and have to be opened to access the USB port. Noise reduction in this model is extremely great considering that is it is a basic SUV. The trunk has sufficient room for loading decent amount of goods. Overall it is a great SUV and very practical for city and highway driving. This is my third Honda CR-V and I am very pleased with Its cost ( approximately $24, 000 ).